Hill type functions have been often used to fit the fractions of parent radiotracer in plasma. , where 0 ≤ a ≤ d, b ≥ 1, c > 0, 0 < d ≤ 1, and e ≥ 0. Parameter d represents the initial level of parent fraction, and parameter a the final level. 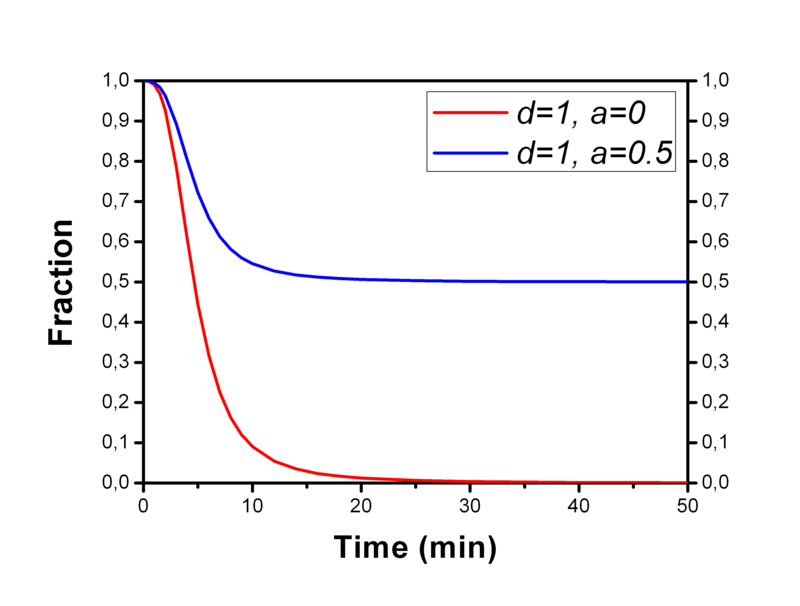 Parameter e is the time after which the fraction starts to decrease (Tarkia et al., 2012). 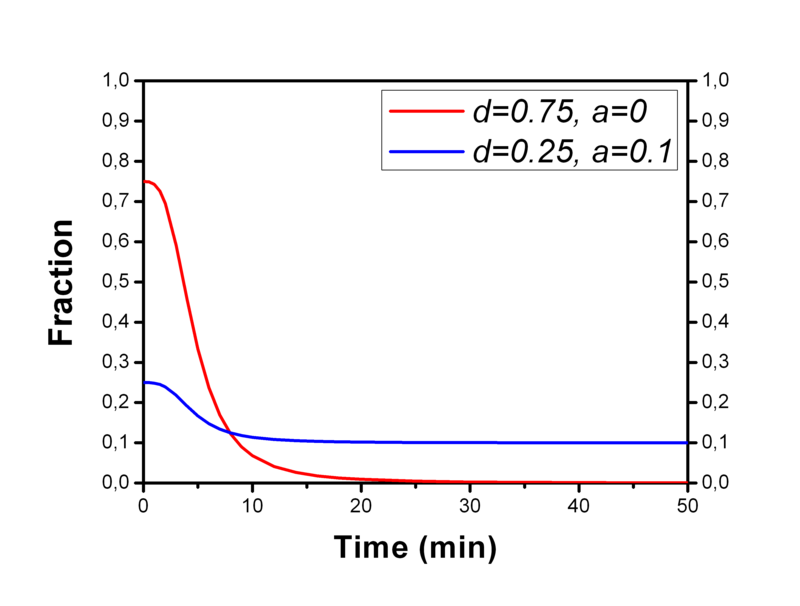 Unchanged (parent) tracer fraction curves can be fitted with fit_ppf with option -model=HILL. Both parent fractions and two metabolite fractions can be fitted simultaneously with fith2met, assuming that the a single Hill function shape can fit all the fractions. If measured parent radiotracer fractions do not seem to reach a steady level during the measurement, or extrapolation is needed and you are not comfortable with the assumption of steady final level, then the power function should be applied instead. Bindslev N. Hill in hell. In: Drug-acceptor interactions. Co-Action Publishing; 2008. p. 257–82. Giraldo J. Empirical models and Hill coefficients. Trend Pharmacol Sci. 2003; 24(2): 63-65. doi: 10.1016/S0165-6147(02)00048-2. Guo Q, Colasanti A, Owen DR, Onega M, Kamalakaran A, Bennacef I, Matthews PM, Rabiner EA, Turkheimer FE, Gunn RN. Quantification of the specific translocator protein signal of 18F-PBR111 in healthy humans: a genetic polymorphism effect on in vivo binding. J Nucl Med. 2013; 54: 1915-1923. doi: 10.2967/jnumed.113.121020. Jucaite A, Svenningsson P, Rinne JO, Cselényi Z, Varnäs K, Johnström P, Amini N, Kirjavainen A, Helin S, Minkwitz M, Kugler AR, Posener JA, Budd S, Halldin C, Varrone A, Farde L. Effect of the myeloperoxidase inhibitor AZD3241 on microglia: a PET study in Parkinson’s disease. Brain 2015; 138(Pt 9): 2687-2700. doi: 10.1093/brain/awv184.